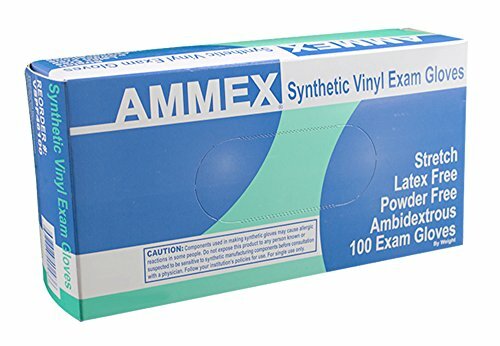 Ammex stretch powder free exam grade latex free disposable glove. These medical grade stretch vinyl gloves are durable, form fitting and provide excellent tactile sensitivity. Stretch vinyl gloves offer the fit and feel of latex in a synthetic glove. The extra stretch minimizes the tension on the muscles of the hand that can result in the aggravation of carpal tunnel syndrome. Totally latex free, an essential factor for people who are allergic to latex proteins. These gloves are powder free to eliminate residues. Beaded cuff. Made from component materials which comply with FDA regulations for food contact. 21CFR, 170-199. Large size.